Twin suicide car bomb explosions killed at least 57 people in the Syrian city of Homs, on Sunday 02/21/2016. Soon after the Islamic State claimed responsibility for the twin bombing. Despite the claim of responsibility it is possible that other elements of the Islamic insurgency in Syria, like Jabhat al-Nusra. now under intensive attack of the Shiite Coalition, backed by Russian air power, are behind the explosions. At least 100 others were wounded by the explosions in the city center’s Zahra district, in a predominantly Alawite neighborhood, the minority sect to which President Bashar al-Assad belongs. the Observatory added. Few hours later 4 more blasts, including at least one caused by a car bomb, hit near a Shiite sanctuary south of Syria’s capital Damascus, the Syrian Observatory for Human Rights monitoring group said. State television said “three terrorists attacks” near the Sayeda Zaynab shrine had left dead and wounded, without providing a toll, the shrine was already the target of a suicide attack three weeks ago, on 01/31/2016. Some sources said the death toll in Sayeda Zaynab reached over 60 . The shrine is directly guarded and protected by the Iranian Revolutionary Guard and two car bombs within three weeks in that holy place are a major blow to Iran’s prestige. 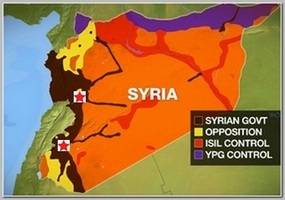 Sunday’s attacks also came a day after government advances against opposition in Northern Syria in Aleppo province. . The Russian foreign ministry confirmed that Lavrov and Kerry had spoken about conditions for a ceasefire in Syria on the telephone on Sunday but it is doubtful if there is a way to commit all opposition factions to such a deal especially when Turkey and Saudi Arabia are supporting many of those groups . ** The attack on Sayeda Zaynab was also claimed via social media by I.S.I.S . ** As Bashar’s forces make some gains in the battle field it is obvious that the opposition is changing tactics to suicide and car bombings and guerrilla warfare .